It’s been a while since I’ve written a fragrance post. In fact, it’s been a while since I’ve been for a play in the perfume departments and beauty stores so I’ve not found any new ones that I’ve liked. Instead, I’ve been using up all of the different perfumes I’ve already got, in some attempt to save a little money. After all, new perfumes are not always best. Most of my absolute favourite perfumes are older classics. Take Eau Dynamisante, for example. Created in 1987 by Clarins, this is described as a ‘treatment’ fragrance for both men and women by Clarins, and therefore is missed from some perfume reviews. Most notably for me, it’s missed from ‘Perfumes: The Guide‘ which is my fragrance bible. This is perhaps because it’s designed to be worn all over the body as an aromatherapy type treatment, rather than ( in the words of the immortal Coco Chanel) ‘where you want to be kissed’. I don’t consider Clarins particularly when I think of perfume in the way I would with companies such as Guerlain, who have moved from perfume into skin care and make up. 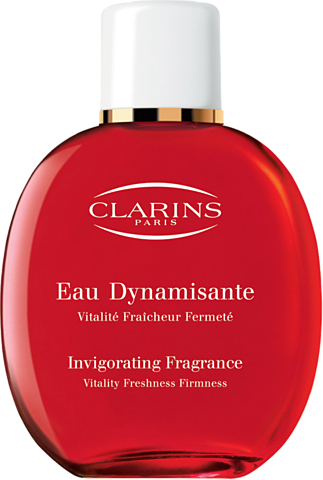 I always think of Clarins as predominantly a skin care company and yet this fragrance has been a success for over 20 years.